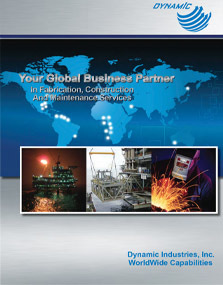 Dynamic is a proven leader in heavy and light fabrication; our experience includes fabrication of offshore jackets, decks and process modules. We are also experienced in providing the multi-discipline crafts required for topsides facilities fabrication offshore. We have the experience and capabilities to provide engineering for our clients. We can provide fabrication and constructability input for the design and execution process. Dynamic has extensive experience in international offshore logistics, having performed hookups that required Permit to Work and SIMOPS procedures. We also provide extensive global commissioning experience along with the craft personnel to plan and execute the commissioning of modules, platform and brownfield facilities for both onshore and offshore projects. For every project, a commissioning plan will be developed with our client’s input to insure a safe, timely, and thorough execution. The most important variable to a successful project is project management. Dynamic has an impressive track record of managing turnkey projects around the world with emphasis on client relationships, project controls, and procurement. Dynamic is very experienced on the subject of design, planning, procurement and execution of both offshore and onshore brownfield projects. We very successful at working with the demanding requirements and risks associated with international brownfield construction on a turnkey basis.